Even in the hardest lives, some light must shine. Violet Clancy can take no more of her brutal stepfather's attentions, so when he meets a tragic end she feels justice has been done. Looking around the bleak and pitiless Black Country town of Wednesbury, she realises that there are many other wrongs that she could help to put right. Joining a coterie of women who call themselves the Wednesbury Wives, Violet and her friends are determined to win justice for the abused. Their mission is to bring a little light into the hardest lives. Before long the wives find laughter and romance in their close-knit town. But will their friendships survive when some of their good deeds are brought into doubt, and some of their methods are called into question? And is justice always worth it, no matter what the price? The Wives’ Revenge is a new historical novel by Lindsey Hutchinson. We are swept back to 1887. Violet Clancy lives with her mum, Kath Clancy Sligo and her step-father, John in Wednesbury, England (the Black Country). Primrose Berry has done it again. She caused trouble and Violet was blamed for it. Violet knows what will happen when John finds out. When Kath finds out what John has been doing to her daughter, she calls a meeting of the Wednesbury Wives’ (Annie Green, Mary Forbes, Martha Slater, Kath Clancy, Joyce Clews and Violet Clancy). John Sligo soon meets an unfortunate demise. Woman in the town know if they need assistance, they can get help from the Wives’. They assist abused woman, find lost children, and so much more. Violet is asked to join the group when she leaves school and starts looking for work. After what happened with John, Violet avoids men. Then the persistent Spencer Gittins comes along. He is a kind and compassionate young man who falls for Violet. After the two marry, Violet can provide more help to the town. This group of close-knit women set out to get justice for the abused (sometimes revenge) and help the poor in their town. See what a group of hardworking and caring women can do when they band together in The Wives’ Revenge. The Wives’ Revenge is an engaging novel that captured my attention from the very first page. I found the book to be well-written and have very lifelike characters. Thanks to the authors descriptions, I could visualize the town and her characters. I thought the author did an excellent job at capturing the time period especially with the dialogue (though, I did not like the continual use of the word wench). It was a very different time when the laws did not protect women and children. But the ladies of the Wednesbury Wives’ could and would help them. The Wives’ Revenge has a heartwarming ending. I do want to mention that the book contains foul language, violence, murder and sexual assault. Some of situations are just heartbreaking. There is also love, respect, courage and lifelong friendships. My rating for The Wives’ Revenge is 5 out of 5 stars (I loved it). I found the authors use of what my father called “ten dollar words” amusing (I love big words) and I learned a new word too (coterie). 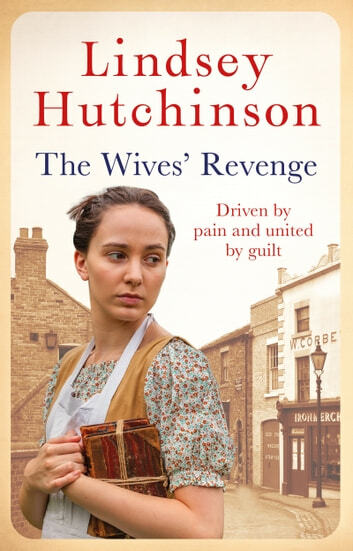 The Wives’ Revenge is one of those books that you will be thinking about for days after you finish it (it lingers in your mind). I will be reading Lindsey Hutchinson’s next book The Lost Sisters. Great book. Easy reading. I highly recommend it. I enjoyed the book to a point, but thought that, there were a couple of anachronisms within, but over all I. Like when all the problems and beside characters you learn what happens to them too. Very light reading and fairly predictable. Not my usual read and probably won't read any more but if this genre is your cup of tea you'll be delighted with it. Each time I thought the story was coming to an end it opened new chapters and lives. Definitely worth reading.